Today Montblanc ranks as one of the top luxury brands in the world, but as is often the case its origins are quite humble. Founded in 1908 by Claus-Johannes Voss, Alfred Nehemias and August Eberstein, the firm then known as the Simplo Filler Pen Company could count on the skills of a stationer, a banker and an engineer respectively. Moreover, this Hamburg-based company is German, not French or Swiss, as one might have deduced from the name. Montblanc was, in fact, first used as an export label for its very finest masterpieces, before the company adopted the name entirely in 1934. 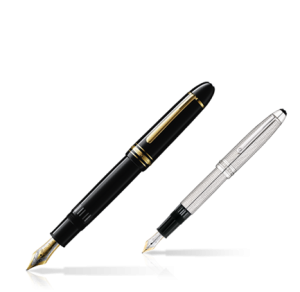 A pioneer of many innovations and improvements in pens and fountain pens over the years, Montblanc is above all known for the quality of its design and workmanship, and became synonymous with the very finest stationary available. Now, as part of the Richemont group of luxury brands, its range has grown to also include watches, leatherwear, jewellery, eyewear and perfumes. Such is the reputation of this brand that its famous six-pointed star, which adorns the top of every true Montblanc pen, is instantly recognisable the world over. Representing as it does a bird’s eye view of the snow-capped mountain in the French Alps, the logo has rounded edges that form a distinctive white mark on what are traditionally black lacquer pieces of great elegance and refinement. If it is outstanding design and craftsmanship that Montblanc has built its name on, then this is something that has been carefully maintained as the company expanded its product range. This means that the watch, jewellery and leatherwear collections that carry the brand name hold the same position in their respective markets as do the pen collections in theirs. Often produced in limited edition series, they include the Nicolas Rieussec Chronograph Open Hometime watch, with its masculine elegance, and the TimeWalker TwinFly Chronograph GreyTech, the latter capturing the classic design appeal of the 1950s. The jewellery collection is equally inspired, featuring diamonds cut in the make’s own iconic star shape, along with beautifully worked silver and semi-precious hard stones. Every new range has its own appeal, but somehow the classic Montblanc design philosophy is visible throughout, even in the elegantly styled and beautifully stitched leather bags, accessories and luggage made with Italian calfskin and detailed with silver. Montblanc will, however, always be first and foremost associated with pens, and the crème de la crème of its collection remains the range of limited edition pieces that are sought after by collectors around the world. These include the series dedicated to great writers and patrons of the arts, such as the Collodi collection, with its classic combination of black lacquer and intricate silverwork, or the exquisite Maecenas pen that deviates from the theme with simple ribbed silver and white lacquer or a more elaborate gold and marbled finish. While not a limited production series in itself, the original Meisterstück classic, used by heads of state from Konrad Adenauer to Barrack Obama, is an icon of the brand and just as highly sought after by collectors. Either way, Montblanc represents the summit of excellence in terms of the quality it represents – and a very personal luxury to reward those who have achieved in their own fields. This entry was posted on Monday, March 24th, 2014 at 7:34 pm	and is filed under Design, General Interest. You can follow any responses to this entry through the RSS 2.0 feed. Both comments and pings are currently closed.